Well loved with heavy wear and lots of prior play. There are scratches and scuffs, cracks in the wind shield, and other signs of use. It's built to last, and still has a lot of play remaining! Geoff Bodine. Davey Allison. 1:64 Scale. This is a NIP Die-Cast 3 car set from racing champions and STP. Die-Cast Car. Never been opened. Card in like new condition. Here's another item for your viewing from pickers and grinners Collectibles. 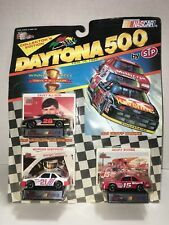 This Racing Champions 1:24 1997 Bill Elliott #94 Mac Tonight is a really nice item and would make a great addition to any collection. "Grimace Go-Car 0 1/2", model is new in box, box shows shelf and handling wear. 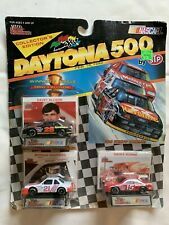 Geoff Bodine #7 1997 Edition Racing Champions. Released in 1993 by Racing Champions. New 1995 NASCAR Craftsman Super Truck Series # 7 Geoff Bodine Exide Batteries truck made by Racing Champions in 1995, Truck is R.C. Premier Edition Bank W/key, 1:24 scale, diecast metal, great graphics on truck. 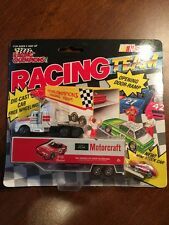 The truck is NEW in original unopened box. The box shows very minor shelf wear and is in excellent condition, The item pictured is the item that will ship, please look at all pictures as they are part of the description. The box is 10" x 4 3/4" x 3 1/2". Car is 7 1/2" long. 1 OF 25,000 PRODUCED WORLDWIDE. CHEVROLET MONTE CARLO 83 N°5 LEVI GARRETT. 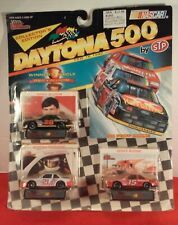 TEAM Hendrick Motorsports Pilote / Driver Geoff Bodine: WINSTON CUP 1985. it unique models and no series like the Spark each models was assembled with a lot of passion and with certainty you will not find a 100% identical on the market.